Shenhav One of a Kind crochet , statement collar necklace. This necklace was inspired by the vintage Van Cleef and Arpels necklace that Eva Mendes wore at the Golden Globes 2009. It is crochet with Amazonites, Turquoises and crystals. 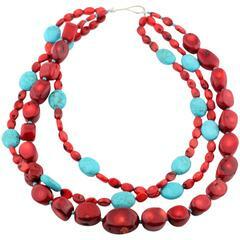 The necklace is crochet with a smooth passing thread. It is a cotton thread coated with a gold color polymer. It has no metal content. 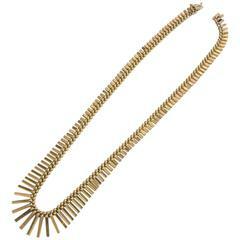 The necklace measures approximately 43 cm in circumference. Shenhav's inspiration comes from the world's wide-open vistas. The ivory Coast, the African French Republic of Cote d'Ivoire, is the place she owes her name (Shenhav being the Hebrew equivalent for "ivory") and where she was first deeply stirred by the beauty and diversity of life. Taught by her mother to crochet ornamental mats at a tender age, Shenhav quickly took pride in crocheting the tightest of stitches, lending her creations a captivating, almost machined precision. Her natural curiosity and inventiveness took things further, bringing her to passionately explore crochet techniques in adulthood, and ultimately transform, refresh and adapt an ancient craft to the design sensibilities of modern times. Having been raised and educated in countries all over the globe, Shenhav loves to work with contrasts. 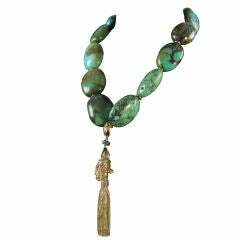 Working with a mix of refined modern threads enables her to exhibit her similarly deep appreciation for elegance and grace, with the natural stones and crystals added in for natural value and dramatic tone. Shenhav's creations' detail, intricacy, delicateness are only part of the story. The true hidden beauty of her art form lies in her ability to create anywhere and everywhere. A reel of thread, some gleaming natural stones or crystals, a crochet needle and her imagination are all that she needs. Her work is inspired by nature and urban landscapes alike, so being able to forge her creations right there, wherever she may happen to be, can be extremely gratifying. And when her creations are finally worn, with the energies just right, that’s when the real magic happens. The jewel continues its journey of evolution to take on the very aura of the woman, and ultimately becomes part of who she is. 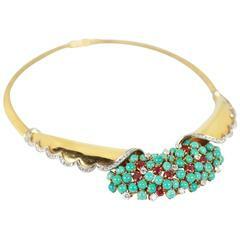 Solid 18K gold necklace inlaid with diamonds, rubies and turquoise stones.